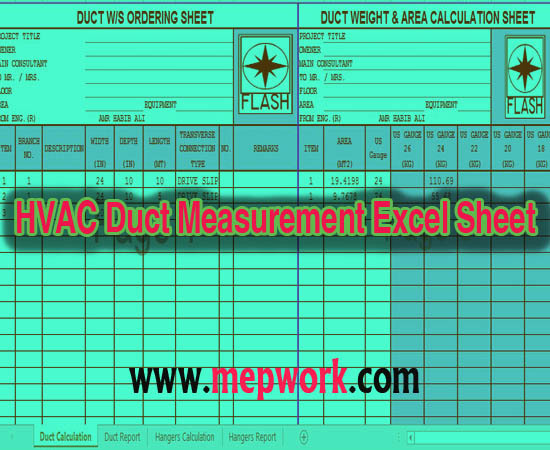 This excel sheet is for HVAC duct measurement like duct weight, duct area and all calculation related to ductwork like hanger supports and duct insulation. The spreadsheet is for duct sheet metal quantity estimation. Accurate measuring of HVAC duct systems for insulation and cladding is important as it will reduce manufacturing time, reduce waste of materials, speed up installation time and improve the overall appearance of the job. No, all calculations are available but the spreadsheet is copy righted. you can perform calculation without changing in formulas.